There’s a serious risk in sharing my ‘Best of Byron’. Sure, Byron Bay is possibly the greatest place on earth and is always part of the if-you-could-live-anywhere-in-the-world conversation my husband and I like to have for fun sometimes. But part of the magic is that Byron has all the ingredients of a dream tourist attraction yet it hasn’t been destroyed by tourism (although, to be fair, some would argue that point). So, what I’m going to do is, I’m going to impart my Byron Bay wisdom as long as you promise to never build a McDonald’s there, okay? Cool. I don’t want to seem like a stalker or anything, but Bayleaf Café is the best and I want to marry it. Specifically, I want to marry the dukkah poached eggs, the summer porridge and—oh my daaaaays—the coconut cold drip. It’s heaven in a glass. The vibe here is seriously Byron. It’s always buzzing but there’s no sense of chaos. Tell them we sent you. They won’t know what you’re talking about, but it’ll be funny after a while. Next door to Bayleaf is its younger, faster li’l sis, Leaf and Grain. With hearty salads the star of the menu, takeaway is the focus for this new kid on the block, although not at the expense of quality. In true Byron style, Leaf and Grain is serious about community, too. They give 5 per cent of all profits to local charities and operate a pay-it-forward system, giving customers the opportunity to purchase food and/or drink to be subsequently enjoyed by someone less fortunate. Location, location, location. With its ocean-adjacent position, Italian at the Pacific is well worth your time but the contemporary restaurant doesn’t rest on its sea-salted laurels. A robust Italian menu features something for everyone or, more accurately, it features many things for everyone. IATP shares its forecourt with the Beach Hotel making for a more casual feel outdoors. Inside, the smart-casual décor allows for something a little cosier. A little further from the buzz of Jonson Street, The Top Shop is a Byron Bay icon. It is corner shop done cool with simple, healthy food and a great selection of drinks, including beans from Sydney’s Single Origin Roasters. There are tables and chairs inside and on the small deck but the ‘pozie’ that epitomises this café is on the front lawn, soaking up that sweet Byron sunshine. Let me be clear. OzyMex is a takeaway joint with zero bells and fewer whistles. But those fish tacos? Fresh, zesty and delicious. My tip: grab a couple of those tasty little parcels and enjoy on Main Beach’s grassy knoll just a couple of hundred metres away. Sat on the outskirts of town, Folk Café serves up wonderfully fresh and organic food to hungry locals and visitors alike. Sure, it gets busy on weekends, but it’s worth the wait when you get yourself a table outside and a plate of their awesome poached eggs with spiced chickpeas. Oh, and a coffee. Always a coffee. Yep, that’s right. 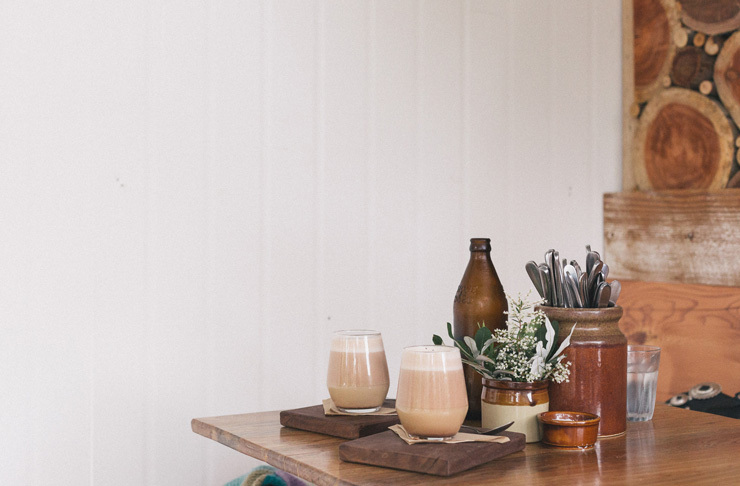 The deliciousness of Bronte’s favourite café is now available in Byron Bay following last year’s launch of The Farm. Foremost, The Farm is—perhaps obviously—a working farm, but it is also home to a number of micro-businesses including a café, restaurant and produce store. The Three Blue Ducks team is behind all three. It’s wise to jump online and make a loose plan of your visit. Arriving ravenous and ready for brunch to find breakfast service over and lunch service pending is a pretty annoying mistake. St Elmo is a highlight of Byron Bay’s dinner scene. Spanish tapas and share plates are the focus; a blessing since choosing just one dish would be near impossible. With a creative mix of flavours, textures and combinations, the menu flirts a little with your imagination and your appetite, and the plated product does not disappoint. Drinks reach the same high standard as the food. The wine menu features more than 100 Australian and international wines and more than 15 are available by the glass. For many, myself included, a trip to Byron Bay isn’t complete without a visit to the Beach Hotel. Overlooking Main Beach, the popular pub is the ultimate Australian beer garden. You can get breakfast, lunch or dinner at the Beach Hotel but the space is best enjoyed with a few beers on a Sunday afternoon. Or any afternoon for that matter. Hey, we’re on holidays! Occupying the corner of Jonson and Lawson, The Balcony is a great spot to soak up the Byron buzz. I’ve got a bit of a crush on The Balcony’s cocktail menu (and dropping the price of an espresso martini to $12 between 9.30pm and midnight doesn’t hurt). Do your best to score a seat not just on the balcony, but at the rail. The people-watching is part of the fun. I know, I know. I already gave Italian at the Pacific big props in the food department. But the white chocolate and passionfruit martini knocked me off my feet, so I think they’ve earned a second mention. Like the cocktail menu, IATP’s wine list makes for delicious reading, as you might expect from a quality Italian establishment. If, like me, sometimes you just feel like saying “all I know is I want a great red that isn’t a pinot”, staff have got your back. It doesn’t have the beach view but The Northern Hotel does have a classic pub feel and icon status. The front bar overlooks Jonson Street and is another people-watching hotspot. It boasts the charm of heritage features and, at night, the sounds of live blues, rock or folk music. Meanwhile, the backroom is a hero of the Australian music scene and attracts plenty of big names. Previous acts include the White Stripes, Dizzee Rascal and PJ Harvey. Byron Bay is a bit fab, as I may have already over-emphasised, but one of its best features is its proximity to a whole lot of other fab places. Mullumbimby, Bangalow, Lennox Head, Nimbin, Kingscliff, and the Gold Coast—to name but a few—are all an easy drive from Byron Bay and each has its own tourism value. Plus, there’s such great value in the road trip itself, especially when travelling with your people. For me, treat yourself means time at the spa and you’ll find me at The Byron at Byron, Gaia Retreat in nearby Brooklet, or Buddha Gardens. But perhaps you’d rather let nature treat you by watching a picture-perfect sunrise from Cape Byron, tackling one of the many walking tracks, or catching a few morning waves. Then again, treating yourself might mean planning absolutely nothing. And I can get on board with that, too. As well as a few familiar shopfronts, you’ll find plenty of quintessentially Byron options too. The best of the bunch include Spell, Hope & May, and Pompidou where you’ll find dreamy threads, gorgeous homewares and coveted jewellery. It would be disloyal of my to give top billing to anyone else. The Byron at Byron has been a mainstay of my semi-regular Byron holidays and it lures me back time after time. Maybe it’s the lush rainforest surrounds; maybe it’s the private beach; perhaps it’s the light, cosy suites… it’s probably the poolside day beds, where I tend to settle in. Located in the thick of Byron’s action, The Atlantic is a collection of styled guestrooms dotted around shared kitchens. The tropical garden setting sets the tone, which is relaxed, yet polished. For groups, you could do a whole lot worse than the Clarks Beach Cottages. The four ocean-front properties offer premier views of ‘The Pass’, arguably Byron Bay’s most iconic beach. Built in the 1920s, the cottages have been thoughtfully restored by the Cape Byron Trust. There are also two heritage-listed lighthouse cottages for a unique stamp on your Byron Bay vacay. Want to see more of NSW? Check out The Urban List's Guide To Bowral.